I love a good budget brand my favourites currently being essence cosmetics (spelled with a small e, it’s not that my punctuation is gone shoddy!) and Catrice. Both brands really deliver when it comes to quality and longevity across all their products, from nail varnish to concealer. I was delighted (obviously!) to get a sneak peak of essence cosmetic’s Autumn Winter collection which you will find on the stands at the moment. Frist things first, I’ve tended to lean towards Catrice in the past I think maybe because the stand looks more grown up or something, previous Cinderella collections from essence appeared pitched at a younger audience than myself. I have to say this latest collection appears far more sophisticated than previous offerings. Starting with the lips I was sent three of the sheer and shine lipsticks and two liquid lipsticks. I love a good lip product but as my collection grows I just don’t get the wear out of what I own. I want something that can be applied preferably without a mirror and something that isn’t too strong. A bit bright lipstick just isn’t appropriate for where I work. 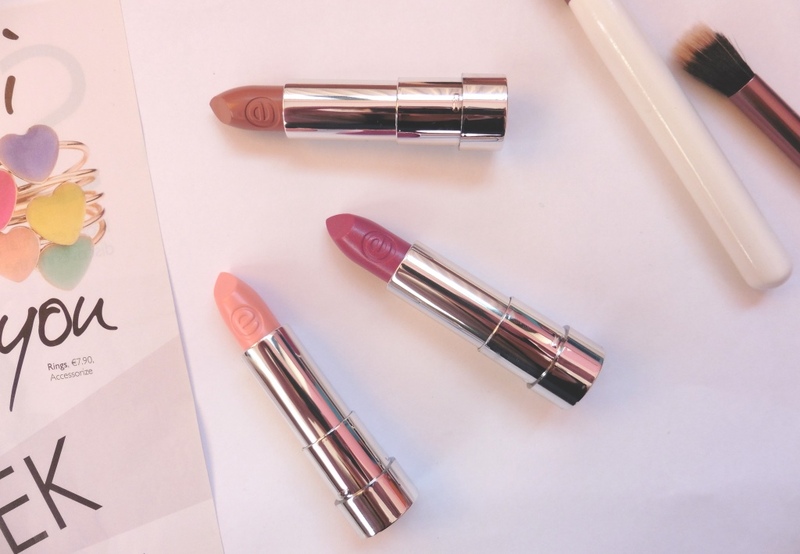 So the sheer and shine lipsticks tick a lot of the aforementioned conditions – they’re light enough to be able to apply without a mirror and sheer enough to be suitable for a conservative workplace. They’re really moisturising too and have a hint of glitter, that normally I’d avoid but it’s very subtle. My favourite colour is the brown shade which doesn’t look very appealing in the tube but is a really gorgeous, warm shade when it’s on. They don’t last all day but I wouldn’t expect that from a moisturising lipstick, you’ll get a couple of hours out of them at best. There are 12 shades in the range and they cost €2.49 each. I haven’t gotten a huge pile of wear out of the liquid lipsticks, they require a bit of extra work when you’re applying them and take a lot of lip-smacking to get them to sit properly. Once it does settle down on your lips though it does give a lovely colour with no stickiness you’d usually get from liquid glosses. So you can wear these on a windy day with your hair down! These liquid lipsticks are nicely pigmented without being gaudy and, when they fade, leave a nice hint of colour on the lips. There are 6 shades in this range and they cost €3.09 each. These products are all in stores that stock essence and also Penny’s nationwide. *I was sent these products for the purposes of a review. I like the sound of both of these – I’m a big gloss fan, but it is so annoying when they’re sticky. I do like bright lipstick sometimes for a statement, but a sheer one is definitely easier to wear day to day, especially when you don’t even need a mirror to pop it on. Bargain prices too. They’re great value. I tend to veer more towards lip gloss than lipstick. I have to admit I picked up a gorgeous looking Catrice lipgloss a while back but I wasn’t impressed with it at all. These look fab. I really need to pick up some new lippies. The babog destroyed mine awhile back. My local chemist stocks essence so ill have a goo after the school pick up. P.s new blog look is fab! Thanks Kellie! These are great so because at least if the one of your brood attacks them they’re only cheap! They look good, I have never found a good lipstick that I love. I buy so many but rarely wear them! Wow, what fab value for 2,50 each!! Love the color on you, looks really lovely hun. I’m a bit like that too Kaz, the effort of lipstick is too much sometimes!